Dibru - Saikhova is the largest national park of Assam, spread over an area of 650 sq. km. It is located at about 13 kms north of Tinsukia town and about 515 kms from Guwahati and is bounded by the Brahmaputra river and Arunachal hills in the north and Dibru and Patkai hills on the south. This was declared a wildlife Sanctuary in 1986 by the government of Assam by uniting two Reserve forest, viz., Dibru and Saikhowa including some other areas. It was elevated to the National Park status in 1999 restricting its core area to 340 sq. km. with a large buffer zone. 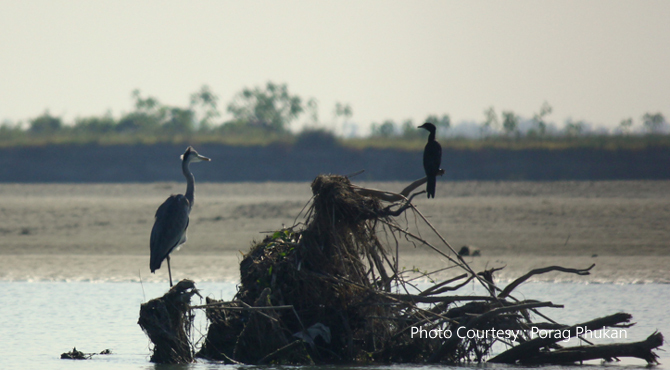 Dibru Saikhowa National Park is one of the 19 (nineteen) biodiversity hotspots in the world. It mainly consists of semi wet evergreen forests, tropical moist deciduous forest, bamboo, cane brakes and grasslands. Situated in the flood plains of Brahmaputra, at an altitude of 118 m above sea level, Dibru-Saikhowa is a safe haven for many extremely rare and endangered species of wild life including over 300 avifauna both endangered and migratory, as well as various species of shrubs, herbs and rare medicinal plants. Though the park was primarily meant for the conservation of Whitewinged wood duck in its natural habitat, it is also the famous for its bright coloured wild h orses known as Feral Horses. Some rare and endangered animals of this sanctuary are Hoolock gibbon, capped langur, slow loris, water buffalo, tiger, elephant, gangetic river dolphin etc. Bird life consists of Spot billed pelican, White bellied heron, Pallah's fishing eagle, Pale capped pigeon, Swamp francolin etc. and migratory birds like Geyleg goose, Brahmini duck, Bar-headed goose, pelican, Black stork etc. Permission is required for entry into the park. Guijan Ghat (10km from Tinsukia) and Saikhowa ghat are the two entry points for tourists. Entry before sunrise and after sunset as well as night halt and picnicking inside the Park is not allowed. There are two forest villages Dhadia and Laika inside the park.